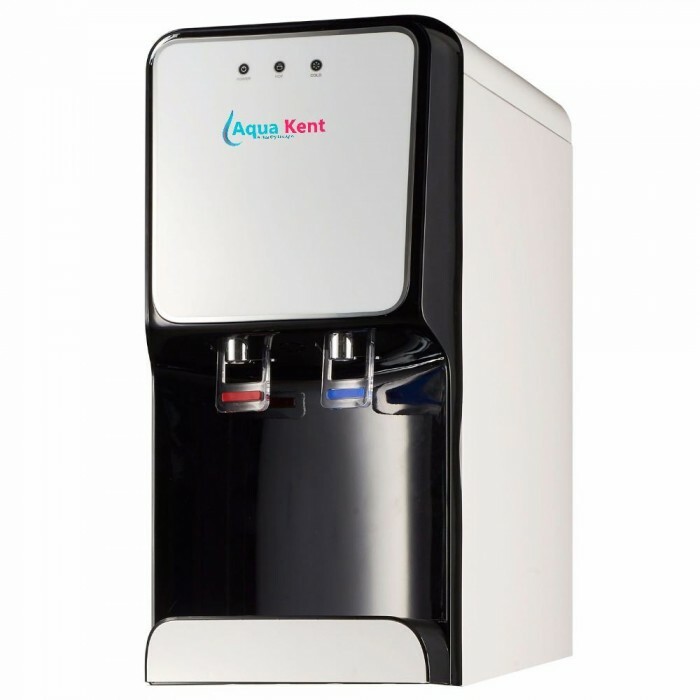 Built with BPA Free materials, the Aqua Kent Infinity Lite UV + UF Hot and Cold Water Dispenser comes with a Built In Water Purifier functions. Operating on European Technology, the hot and cold water dispenser enables you to drink purified, filtered water at the comfort of your own homes, schools and offices. Aqua Kent Infinity Hot And Cold Water Dispenser comes with a direct pipe in system with an inbuilt UV + UF water purification system. Unlike conventional office water dispensers, Aqua Kent Infinity Hot And Cold Water Dispenser makes water better than bottled quality water and saves the hassle of replacing expensive and heavy 20 litres water bottles, which may be tampered with as they are recycled many times from unknown water sources in Malaysia. It is a Slim Table top ( Counter Top ) type and is a multi-functional machine suitable for homes, offices, showrooms, institutions, hotels, etc. Has a high capacity compressor for fast cooling of purified water, supplying cold water to fulfil diversified drinks. Featuring the award-winning feature of the Hot Tank that serves as a highly energy efficient heating system. Incorporating patented technology, the provision of double purification by UV + UF . Running on higher power of 11W UV lamp instead of the standard 8W UV lamp, its ensured to provide complete de-activation of harmful micro-organisms. High-wattage assures better safety against harmful micro-organisms like bacteria and viruses. Aqua Kent Infinity Hot And Cold Water Dispenser is able to purify and filter water from various sources; bore-wells, overhead storage tanks,water tankers and even normal taps. A computer controlled operation has a unique feature – Filter Change Alarm. Time-based Filter Change Alarm notifies the user when to change filters. Operation that is fully automated allows the purifier to begin purification whenever water level in the purified water storage tank falls below maximum,and stop when the tank is filled or when there is no inlet water supply. This ensures trouble free operation without the need of manual intervention. Incorporating a built-in rugged SMPS (Switching Mode power supply) instead of a standard power adaptor, it it is able to handle a range of input AC voltage (200 – 240 Volts) which converts to only 24 DC Voltage thus enables the purifier to stay resilient towards frequent power fluctuations and savings in power consumption. RO membrane housing is the first of its kind in the industry to operate on spin-weld using the latest technology, which ensures high-quality permanent joints. This also prevents tampering and improves membrane life. Fittings and components used within the purifier prevent leakages with the built-in rubber O-Rings within the push-fit fittings and assures saving of water. Corrosion free with a long durable life, users are able to have consistent supply of bacteria and virus free, filtered and purified water.